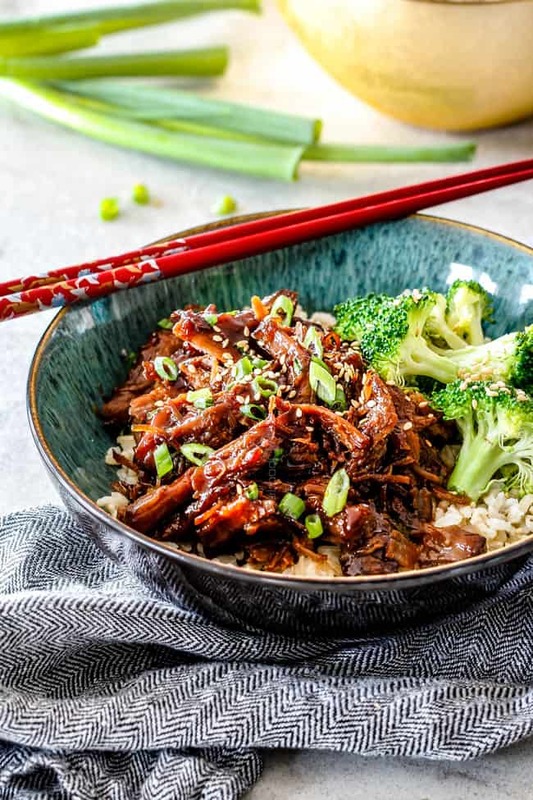 Asian Caramel Slow Cooker Pulled Pork is crazy tender smothered in the most addicting savory, sweet and spicy sauce infused with coconut milk, soy sauce, sweet chili sauce, fish sauce, sriracha, ginger and garlic. You will be licking your plate – and the slow cooker. 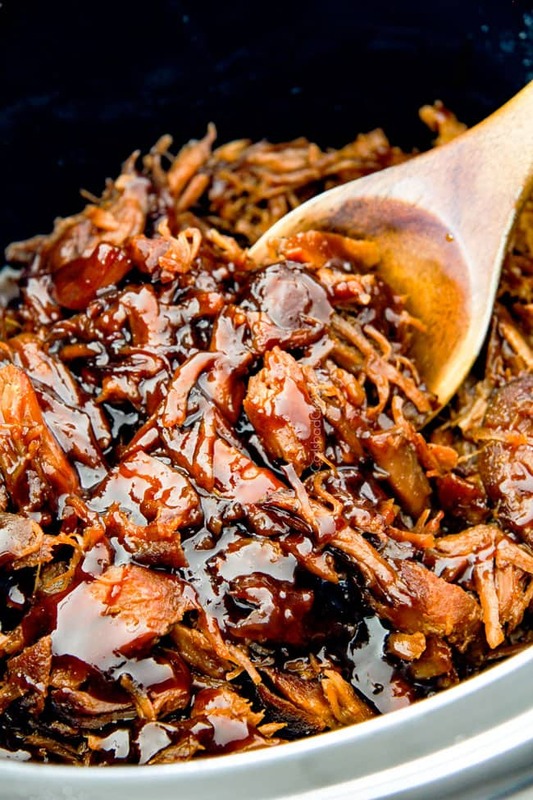 This Slow Cooker Pulled Pork is a fabulous prep-it-and forget it meal, great for crowds, reheats beautifully and is delicious with rice/veggies or delectable in salads, wraps, tacos, or as sliders, etc.! 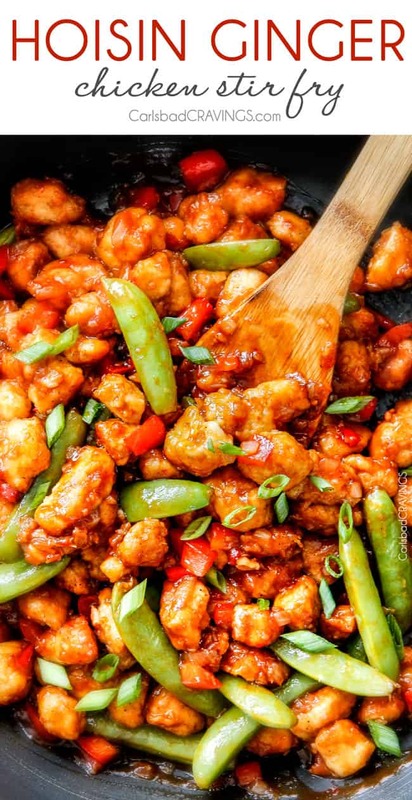 Have you tried my General Tso’s Chicken yet? As I stated in that recipe, it is one of my favorite chicken recipes of all time, so I wanted to create an easier way to lick up that delectable multi-dimensional sauce. Enter Asian Caramel Slow Cooker Pulled Pork. The sauce of this Caramel Pulled Pork is innnnnnnncredible. 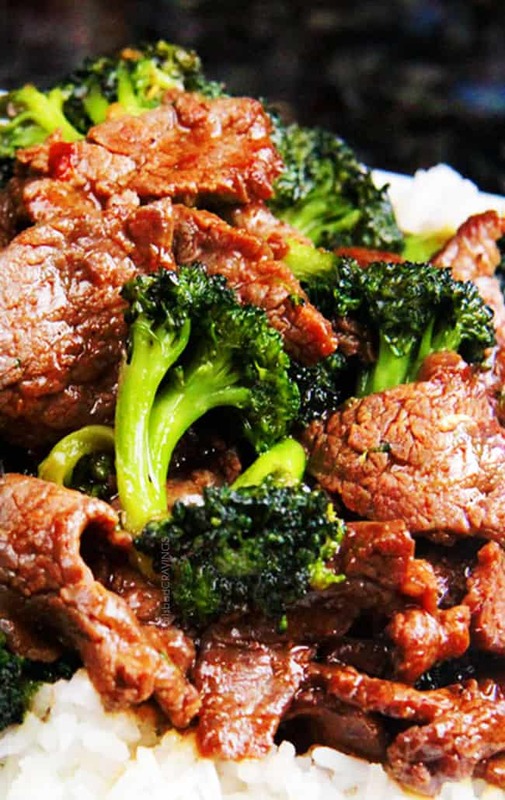 It isn’t a watery, lackluster sauce like many slow cooker Asian recipes. Instead, it is thick and luxuriously silky. It boasts more Thai flavors than my General Tso’s Chicken but is inspired by the Caramel Sauce of my Tso’s Chicken. In both recipes, the savory sauce is infused with “caramel” that we make by simmering water and brown sugar together and then whisking in our remaining savory sauce base. The resulting sauce is nothing short of the ideal ying and yang of sweet and savory, tangy and zingy, with a splash of heat. Wet Rub = Flavor. First, we whisk together a Wet Rub consisting of toasted sesame oil, ground ginger, garlic powder, onion powder and black pepper. If you don’t have sesame oil, you don’t have to buy it just for this recipe. Feel free to substitute olive oil instead. You will notice the Rub consists of 2 whole tablespoons ground ginger – I know that sounds like a lot but I promise it is AMAZING and is needed to cut through the sweetness of the sauce. Seared Pork = juicy and flavorful. Next, we sear our pork to seal in the juices and to create what’s known as the Maillard reaction in which the amino acids and reducing sugar react to create a caramelized, deeply flavorful, rich savory crust. Yes please. Dynamite Sauce. We whisk together our Sauce ingredients consisting of coconut milk, soy sauce, Japanese sweet rice wine, Asian sweet chili sauce, fish sauce, sriracha and cornstarch. Keep in mind if you taste the sauce at this point it will not be balanced because we are going to add the “Caramel Sauce” later. What is rice wine and where can I buy it? The only sauce ingredient you might have a question about is the Japanese rice wine. 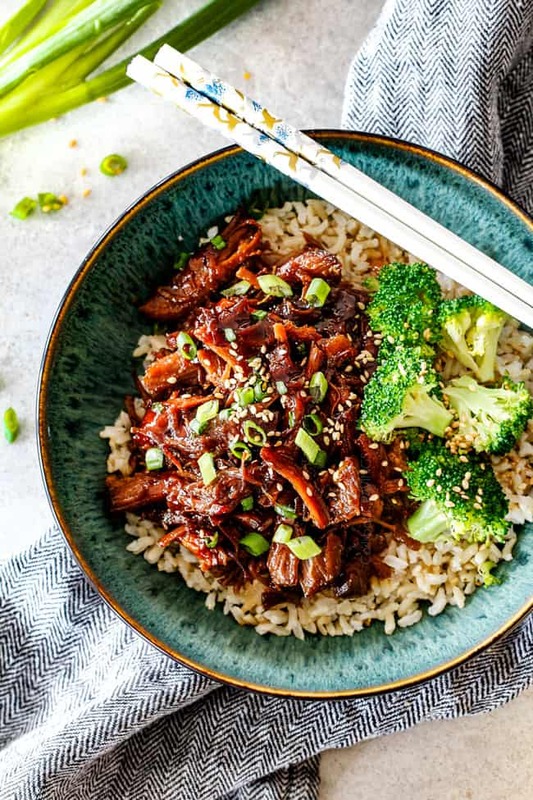 Rice wine should become a pantry staple if you do much Asian cooking because it is used in MANY of my recipes such as my Mongolian Beef, Kung Pao Shrimp and many more. Rice wine is NOT rice vinegar- DO NOT switch them out. Rice wine adds a sweetness and depth of flavor while also tenderizing the pork. Rice vinegar, on the other hand will add an acidic flavor. I use “Kikkoman Aji-Mirin: Sweet Cooking Rice Seasoning” which is commonly found in the Asian section of most grocery stores or you can Amazon it. I highly suggest you google image before you head off to the grocery store so you know exactly what you are looking for. The best substitute for rice wine is pale dry sherry. Cook until Tender. Pour the sauce all over the pork and let it cruise until fall apart tender. If it is not fork tender, it simply needs to cook longer. Caramel Sauce. Once our pork is tender, we remove it to a cutting board until it is cool enough to shred then add back to slow cooker. Meanwhile, remove slow cooker sauce to a measuring cup. If there is less than 2 ½ cups then add enough water to equal 2 ½ cup. We will add this to our Caramel Sauce later. 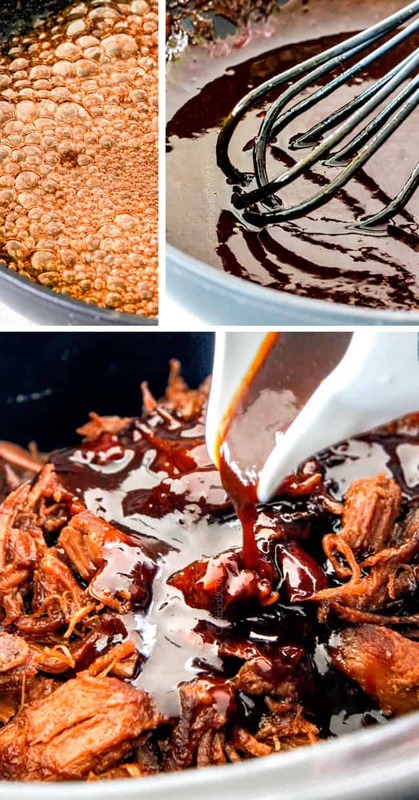 To make the Caramel Sauce for our pulled pork, add brown sugar and water to large skillet and boil over medium heat for 1 minute, whisking constantly. Don’t overcook or it will harden! Slowly whisk in the 2 ½ cups Slow Cooker Sauce and simmer over medium high heat, whisking constantly until reduced and thickened, approximately 7-10 minutes. It is important that you use a large skillet with sides or it will take MUCH longer for your sauce to thicken. If after 7-10 minutes your sauce isn’t thickening for whatever reason, then increase the temperature, whisking constantly. How Saucy? Pour desired amount of Caramel Sauce over pulled pork and toss until evenly coated with a spatula. You may or may not use all of the sauce – totally your preference. EAT! 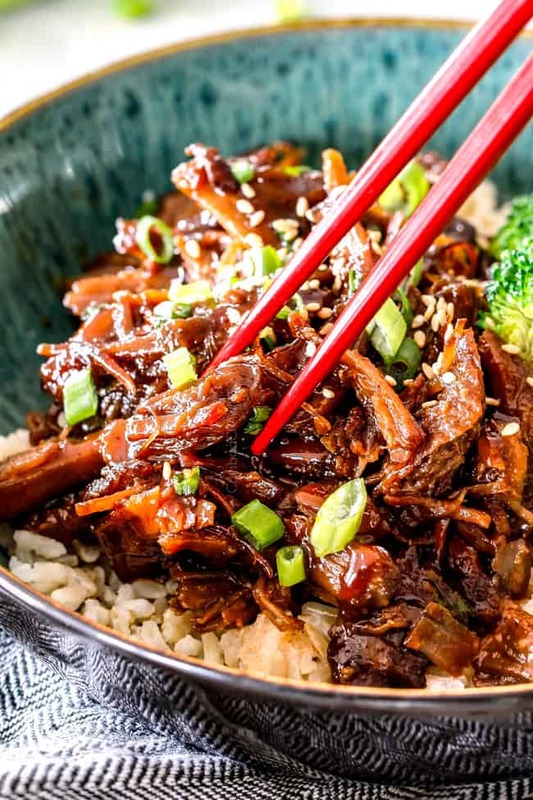 Serve Asian Caramel Slow Cooker Pulled Pork with rice/veggies/etc. 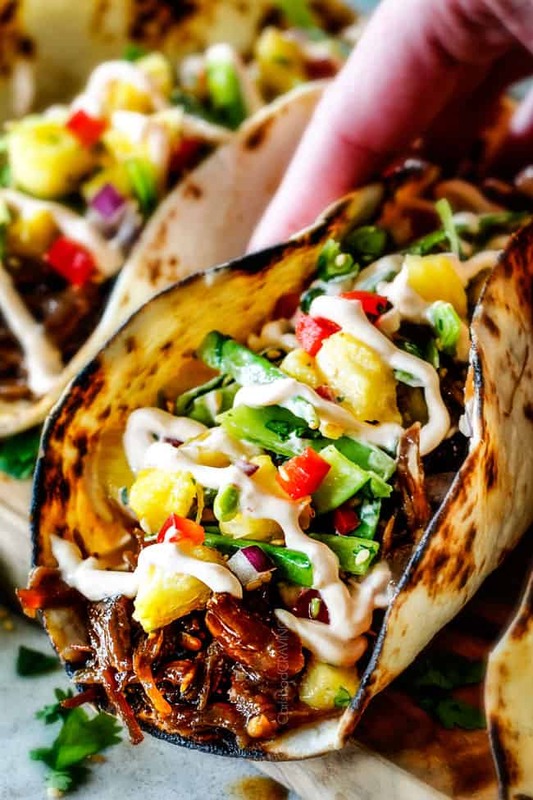 on buns with slaw or my AMAZING Caramel Pork Tacos with Pineapple Snow Pea Salsa! If you love slow cooker pulled pork and beef recipes, then you will love my Slow Cooker Chipotle Pork, Slow Cooker Honey Balsamic Beef, and Slow Cooker Beef Barbacoa! 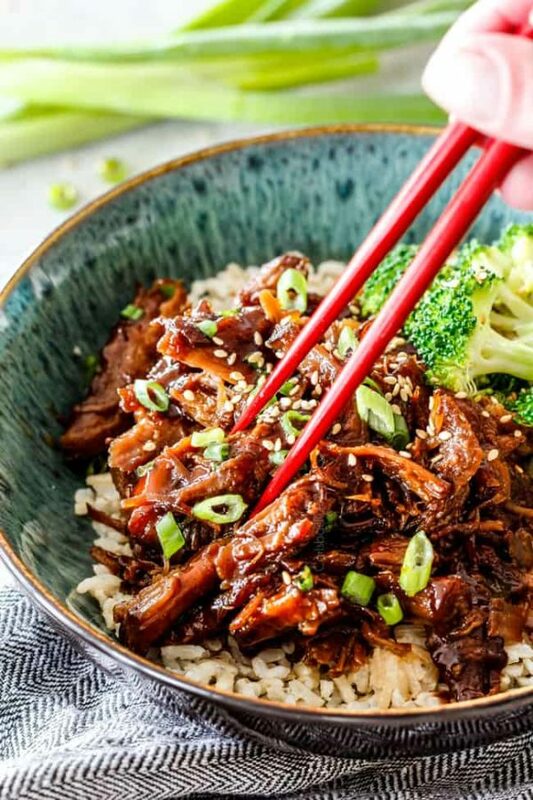 Want to try this Slow Cooker Asian Caramel Pork Recipe? 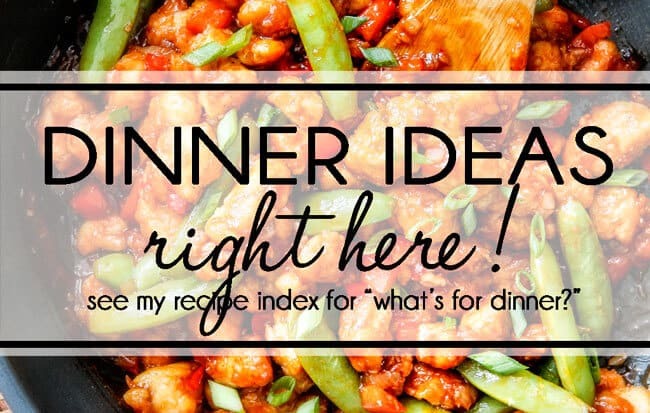 Pin it to your SLOW COOKER, ASIAN or DINNER Board to save for later! Lightly spray a 6 qt + slow cooker with nonstick cooking spray. Set aside. Whisk together all of the Wet Spice Rub ingredients together in a medium bowl then massage it evenly all over the pork. Heat 1 tablespoon olive oil over high heat in a large nonstick skillet. Using tongs or 2 forks, sear pork on all sides until lightly browned. Place pork in prepared slow cooker. In a medium bowl, whisk together Slow Cooker Sauce ingredients (not Caramel Sauce) and pour all over pork. Cook on LOW for 8 to 10 hours or on HIGH for 5-6 hours OR until pork is fall apart tender and easily shreds with a fork. At this point, remove pork to a cutting board until it is cool enough to shred. Meanwhile, remove all of the sauce left in the slow cooker to a measuring cup. If there is less than 2 ½ cups then add enough water to equal 2 ½ cup. Set aside. 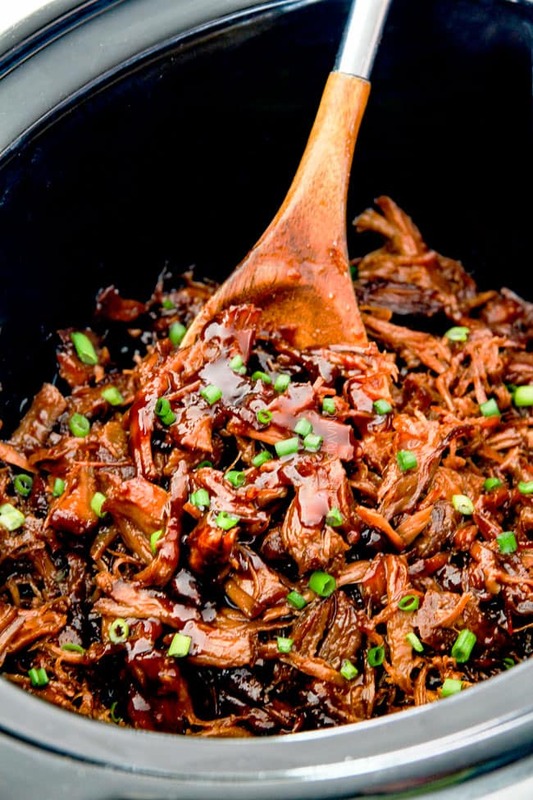 You can add shredded pork back to the slow cooker now that you have removed the sauce. To make the Caramel Sauce, add brown sugar and water to large skillet and boil over medium heat for 1 minute, whisking constantly. Don't overcook or it will harden! Slowly whisk in the 2 ½ cups Slow Cooker Sauce and simmer over medium high heat, whisking constantly until reduced and thickened, approximately 7-10 minutes. Pour desired amount of Caramel Sauce over shredded pork and toss until evenly coated with a spatula. Add additional sriracha for spicier if desired. Serve with rice/veggies/etc. and my Slow Cooker Caramel Pork Tacos with Pineapple Snow Pea Slaw are coming soon! Hi Jen! This looks amazing! I can’t wait to try it. What brand of fish sauce do you use? I’ve had some baaad fish sauce and am now afraid to buy it. Thanks! Thank you Jessica! My favorite is Red Boat 40°N. I hope that helps!!! Dear Jen, I love your column, but I am so perplexed at how to copy your fab recipes. I clearly see your “print” on the recipe page, but when I press it, the sequence of instructions do not come up, as it does for the other recipes I successfully print. Is it something I need to do ? I keep hard notebooks of recipes, sorted by category. I wish I knew more about this, but I am 80, and none of my friends even do this. Can you tell me how to print in very elementary terms ? Thank you very much. Hi Jenny, I am sorry you are having trouble printing my recipes! There are two print buttons – one at the very top of the post underneath the main title and the print icon in the actual recipe above the small photo. If you haven’t tried both print buttons – maybe the other one will work for you? I can’t duplicate the problem on my end so I am sorry I can’t be of more help! Hi Sarah! I haven’t personally tried it but I’ve read that white grape juice is a good substitute. Hope that helps! This recipe looks amazing as always! I am always pressed for time, could this be made in a pressure cooker instead of a slow cooker to save time? How would I adapt the liquids for a pressure cooker since slow cookers loose a lot of moisture while they cook and pressure cookers do not. Can most of your slow cooker recipes be adapted for a pressure cooker? Will you be creating pressure cooker recipes in the future? Hi Lora, I am late to the instant pot train! I don’t have an instant pot yet but I am planning on researching them and getting one shortly. So I’m sorry in the meantime I can’t help you adapt this recipe. Good luck! I literally said wow after my first bite. This pork is incredible! If anyone is wondering if they should make this or not – do it! Hi Lisa, I’m so happy you loved it, thank you! I hope you have fun exploring my site and trying my recipes! I wasn’t sure what to expect flavor wise from this pork but decided to make it based on the reviews- and it was AMAZING! My husband and I fell in love at first bite! Definitely going to be a regular at our house. Thank you for the recipe! YAY! I’m so happy you made it and absolutely loved it! Thanks Monica! Thoughts on modifying this for a 4 qt slow cooker? Will I be OK, or should I only make 2/3 of the recipe? I make pulled pork in this slow cooker with a 4 lb pork shoulder and several cups of water – its usually a tight squeeze but it fits. Would this recipe be similar to that? I made this tonight for our family and neighbors, it was great thank you. The flavor was great and the pork was amazingly tender. I usually make carnitas in the slow cooker and I do not sear the pork beforehand and the pork has not been as tender. I think browning the meat before putting it in the slow cooker with the rub made all the difference. I also de-glazed the pan with the soy sauce (and then added the other ingredients) as I did not want to waste all that goodness. Looking forward to leftovers! What a great recipe to make for a large crows – I’m so happy everyone enjoyed it and that it turned out extra tender! I think you’ll love my Carnitas recipe too as I follow a similar method of searing and a wet rub. Thanks for taking the time to comment Nancy! Is the ginger fresh or the dried? Hi Rachel! It is dried powdered ginger. Enjoy! 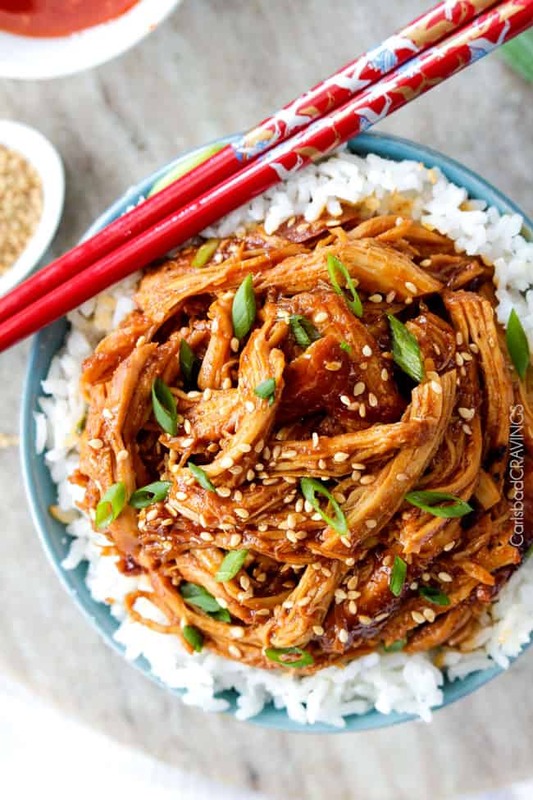 I like the taste of thai food and found your recipe for slow cooker Asian caramel pulled pork. My son is coming for dinner tomorrow night, so I thought I would give it a try. I finished making it today and chose to give a try for myself before passing on to my son tomorrow. OH…WOW! It is so delicious! I am so pleased I made it. I know my son will enjoy it with me tomorrow night. I am going to try your peanut pineapple satay chicken next week. Great pictures of your delicious recipes. There is so much to enjoy. Thank you for the great selection of recipes. Truly awesome. Hi Larry, thank you so much for your awesome comment! I looooove Thai food as well so you’ve come to the right place! You are so thoughtful to cook for your son and I’m so glad this was a winner! I hope you loved the Peanut Pineapple Satay Chicken as well! And if you love Thai food, I highly suggest my Red Curry and my Pad Thai too! Ok….so I always hate it when people comment things like “I made this tonight BUT I added this, changed that, left out this…..” etc….because then I have no idea what the heck they really made. BUT……now I stand in a bit of a crunch, because I made this last night……………..AND it was wonderful……………………AND I did everything exactly as written EXCEPT I did not caramelize the sauce because my husband is a borderline diabetic and I did not want to see a spike. Let me tell you that even without the caramelized step, it was fantastic. My husband and I loved it! It will be a new “American dinner” recipe for our French neighbors this summer and I WILL definitely caramelize the sauce for the neighborhood. Can’t wait. And thank you. Hi Nikki, I’m so glad you did comment even with your change! It is good to know it was still delicious without caramelizing the sauce! I’m so happy it’s a winning recipe to share with your neighbors! Can I make this recipe a day ahead and reheat? It looks awesome! Does the caramel sauce make it really sweet? I’m making it with your pineapple snow pea salsa which has a slightly sweet element. I’m not a huge fan of sweeter foods as an entree. Just trying to figure out if I should leave out the caramel part? Hi Tiffany, it does not make it overly sweet but balances the acidity of the slow cooker sauce, without any of the caramel sauce, it would not taste good. You can always add the caramel sauce to taste. I hope that helps! You were right, the pork was amazing! My whole family loved it and salsa of pineapple and snow peas. I would have never thought to combine those things. You’re great at what you do! Thank you so much Tiffany! I’m thrilled it was a hit with the entire fam! I made it with oyster sauce instead of fish sauce. Will this be a problem? Thanks! It’s finished now and tastes delicious. Not sure if I would taste the difference? This meal was absolutely delicious! Will definitely put it in my regular rotation. One question- I have a TON of the caramel sauce left. Any suggestions for how to use it up? (Can I marinate another pork shoulder in it and slow cook it?). Thank you! Hi Jane, I’m thrilled you loved it! I’m sorry you have so much Caramel Sauce left over! I would use it in shredded chicken and freeze what you don’t want to use right now or you could also just freeze thee sauce. Hi Jen, this looks delicious. Can I make it with beef instead of pork, similar to your balsamic honey chuck roast beef recipe, but with this flavor? Everyone loved this – husband says best tacos he’s ever had (he eats a lot of tacos!). Just wondering how the pork reheats well?, and what is the best way to do that ? I LOVE hearing that, thanks Nicole! Yes, it reheats well – the best is low and slow on the stove with a splash of water to add in some moisture lost when refrigerated. I hope that helps!